Action at the new Cairns Field facility at Saskatoon. 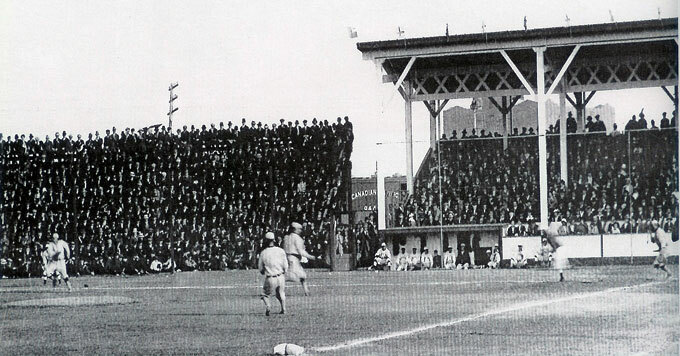 May 14, 1914 - the visiting Regina Red Sox and the Saskatoon Quakers. 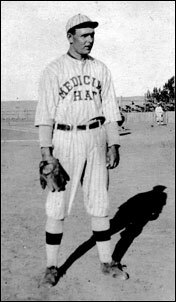 Right - Medicine Hat lefty Jess Buckles who led the league with 25 wins in 1914. This photo, in an April, 1915 edition of the Chicago Daily Tribune, made early reference to his size in noting he was "built like Vaughn", Hippo Vaughn, the Cubs giant-sized (for the era) hurler. He was listed at 6'2", 212 pounds. 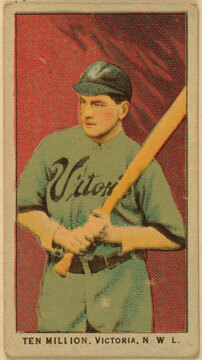 When he joined Oakland in 1917, he was introduced as "a Giant Oak". The big lefty had advanced to the major leagues with the Yankees for two games near the end of the 1916 season. 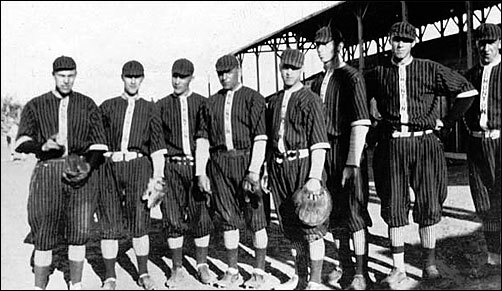 Buckles had come out of California high school and college baseball (he pitched Pomona High to the Southern California championship in 1909 and was a key player for St. Vincent's College, now known as Loyola Marymount). He was still a teenager when he kicked off his pro career with Fresno Tigers in the California League in 1909 (he also claimed to have pitched with Boise that season). He traveled across the county to suited up in 1910 with the Lowell Tigers of the New England League and the Holyoke Papermakers of the Connecticut State League. 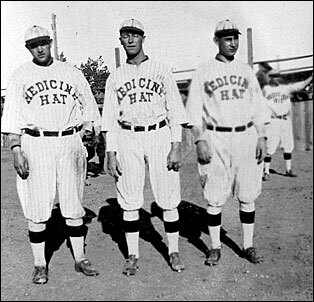 Sold to Vancouver in 1911, Buckles declined to report and appears to have stayed out of the pro ranks in 1911, 1912 and 1913 before winning his release to play for Medicine Hat in the Western Canada circuit. His outstanding campaign (including at least four double-header triumphs) won a Spring Training spot with the Chicago Cubs in 1915. He ended up with Troy in the New York State loop for two seasons and won a promotion to the big leagues with the Yankees for two games near the end of the 1916 season. In 1917, he was sent to Scranton of the New York State loop. The baseball trail begins to fade in 1918 when he shows up in Spring Training with the Cubs and is believed to have signed with the Kansas City Blues of the American Association. 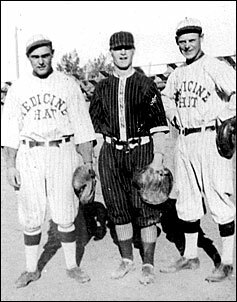 In 1919, he appears to have wound up his baseball play with a summer in Moose Jaw with the Robin Hoods. In the late 1920s, Buckles gained attention through his police work in Southern California. Among other positions, he was a police Captain in Santa Ana. He died in 1975 in Westminster, California. Left to right - three members of the Saskatoon Quakers. William "Chief" Cadreau had appeared in one game in the majors (under the name Chouneau) in 1910, Joe Collins 2B & OF and right-hand pitcher Russell Northrup. Below, some photos discovered in the archives at The Esplanade Arts and Heritage Centre in Medicine Hat, Alberta. It's a lovely on-line site and a spot high on my list of places to visit. We'd love to get some names to go with the following photos. 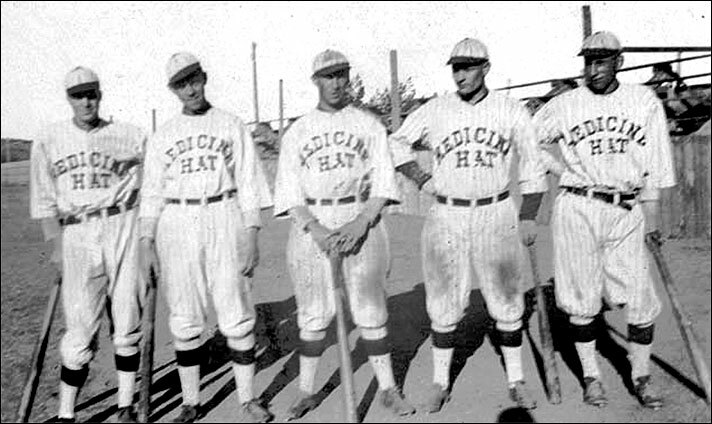 Below - more unidentified members of the Medicine Hat team (and one Edmonton player in the last photo). Right - Calgary manager William Devereaux. Left - Moose Jaw Robin Hoods had Ten Million on their roster. 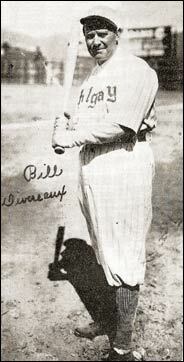 The outfielder gained noteriety mainly through his grandmother's like of different names for her grandchildren. With a last name of Million, she convinced his parents to name him Ten. Later, when Ten and Christine Million had a daughter, grandma had a role in naming her Decillian. Million, an outfielder, played four seasons of minor league ball in Victoria, Spokane, Tacoma, Sioux City and Moose Jaw from 1911 to 1914. He was featured in the Obak baseball card series in 1911 (left). He was born in Mt. Vernon, Washington, in 1889, graduated from Broadway HS in 1908, attended the University of Washington, and became a claims adjuster for the City of Seattle. He died June 18, 1964. Left - pitcher Russell Northrup of the Saskatoon Quakers. 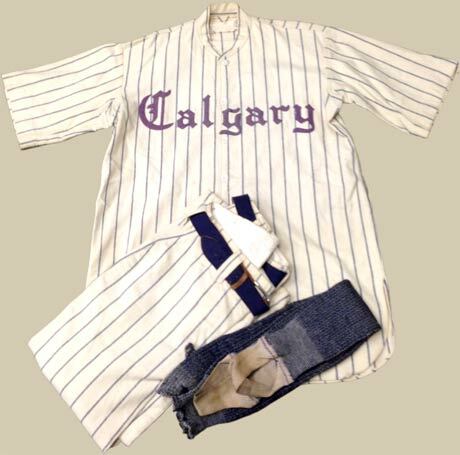 Right - Thanks to David Eskenazi, the Seattle-based baseball historian and collector, a look at the uniform of the 1914 Calgary Bronchos. In colour, no less ! (Hard to imagine baseball in colour during that era as all the newspaper coverage was in black and white.) Pretty classy duds for the time period. 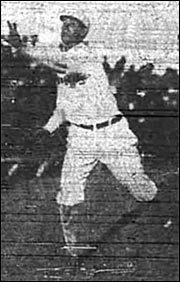 Below - Calgary lefty Wave Kesselring.